To resize your full-size images in the gallery select the Options step and click on the Images tab, just like on the picture below. Now check the Resize images box and enter the maximum width and height of the resized images. 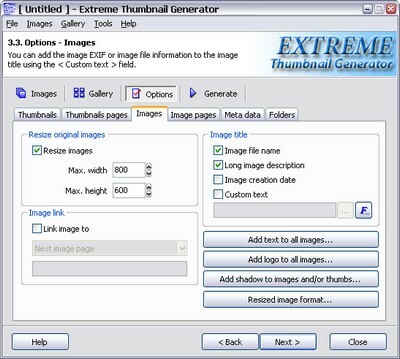 When Extreme Thumbnail Generator resizes full-size images, it scales them preserving the aspect ratio. It means that the image width or height will reduced be fit the exact size specified in the Max. width or Max. height and the other side will be reduced using the same ratio. All resized images are saved in the JPEG format, using the resized image format settings. If image size is less then specified, then it is simply copied into the gallery folder without resizing.